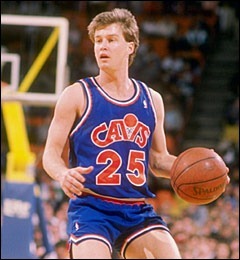 Mark Price has been drafted at 1986 by the Cleveland Cavaliers at number 25 of the 2nd round of the NBA Draft. Even though he was a high second round draft pick he proved his basketball value to everyone and pretty early in his NBA career. Lenny Wilkens entrusted to him the on court lead of the team and he never regreted it. Price evolved into an all-star calibre player from his second NBA season and then at his third season (1988-89) he has been named an all-star for the East. Price was an all-star, three more times in his career, all of them during the 90s. He was really focused and he was leading the talented Cavaliers team with exemptional success. At their best season, the Cavaliers, lost to the Chicago Bulls at the Eastern Conference Finals at 1992 and Price averaged 19.2 ppg. and 7.5 ast. throughout the Play-offs, that year. Mark Price was the eastern version of John Stockton during the 90s although he never reached Stockton’s ability he always enjoyed respect from the other point guards of the league and from the NBA as well, because of his character and his abilities, and this resulted in his selection for the “Dream Team II” squad that played at 1994 World Championship at Toronto. I do remember him being a really fast and smart point guard and another thing that made him special was his shooting. He was a great three-point shooter but his free-throw percentage was unbelievable. He has only recently been passed by Steve Nash as the best free-throw shooter that ever played in the NBA (90.39%). Unfortunatelly Mark Price got hurt at 1994-95 season which actually meant the end of his career as he was traded to the Washinghton Bullets, next year to the Golden State Warriors and finished his career as a player coming from the bench or starting ocassionaly for the Orlando Magic.